In the 1750s section of the Virtual museum are images of a book inscribed by members of the Sunter and Templer families (many thanks to Janet Brown for this). A John Sunter in Ashburton appears in 1715 and in various years afterwards in the lists of Devon Freeholders transcribed on Genuki. He is a yeoman in the lists in 1719 and is shown as Portreeve in 1745 and 1747. In 1759 and (? )1765 a John Sunter is a maltster. Assuming that we are talking about the same John, John Sunter snr., a wool-comber of Ashburton, received a sacrament certificate in 1721. This was to certify that he had taken Church of England Communion - something that anyone holding a position of trust had to do. John snr. died in 1769, aged 70 (see below), and was buried on October 14th. 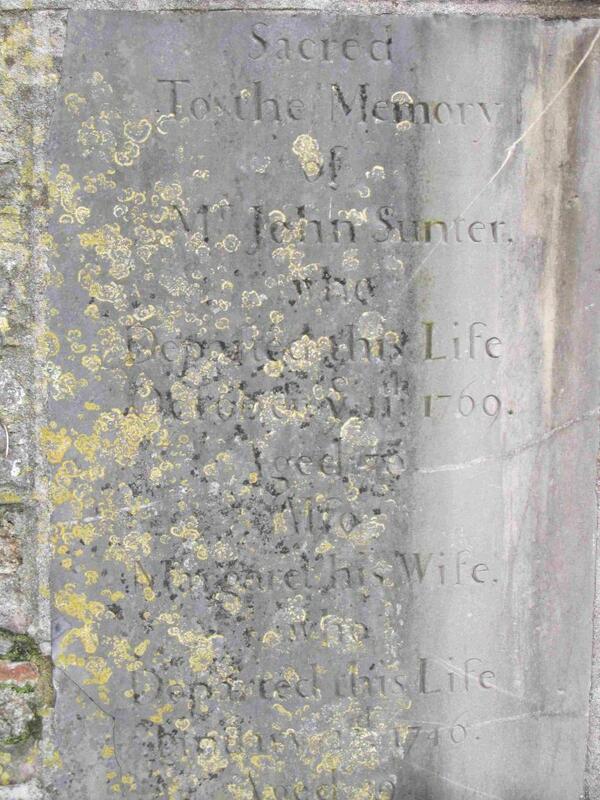 Above: 'Sacred to the memory of Mr John Sunter who departed this life October (?) ye 11th 1769 aged 70. Also Margaret his wife who departed this life January (?) 2nd 1746 aged 39.' Their son Benjamin was baptized at the end of January 1746. In September 1754 a Will Sunter is apprenticed to Saml Vicary of Crediton, Devon, clothier. Benjamin Sunter is possibly a witness at the marriage of Humphry Beals and Phillis Jones in Ashburton in 1761. He appears in the Freeholders lists (see above) in 1772. Both William and Jospeh Sunter appear in the Ashburton section of the list of Devon Freeholders from 1770, when both are described as sergemakers. In 1774 both are clothiers. On the 7th August 1774 Mr. Benjamin Sunter is buried. In 1795 a William Sunter, magistrate, writes a letter to Robert Mackreth, MP for Ashburton, concerned about providing food for the French prisoners on parole in the town. An article in the Exeter and Plymouth Gazette in 1903 details the history of the Volunteer movement in Devon, formed as a response to the threatened invasion of Revolutionary France in 1794. According to the article, the armed association of Ashburton, formed in 1798, included William Sunter as First Lieutenant and Joseph Sunter as Ensign. His brother Joseph is his sole executor, and he makes provision for his wife Mary, brother Joseph and 'dear niece Elizabeth (Jospeh's daughter) upon reaching the age of 25 or the day or her marriage. He also makes bequests to the Devon and Exeter Hospital and the Lunatic Asylum near Exeter. His 'good friends' Richard Collins of Exeter, merchant, and Henry Gervis of Ashburton, surgeon, are mentioned. He also owned land/premises in Callington, Cornwall. Details of will from Janet Brown, to whom many thanks. In 1827 property was being sold in St Lawrence's Lane. Lot 4, drying lofts and store houses, were 'lately in the possession of William Sunter', as was Lot 5, a walled garden which adjoined the previous two lots, which was in Broxy Lane. Joseph Sunter may have been apprenticed to John Charter, a saddler in Exeter, in August 1760. Joseph then appears to have two marriages, the first to Ch. Warden in March 1776. Joseph's final marriage was to Elizabeth Soper on 24th May 1784. On December 6th 1785 the register of duties paid for apprentices' indentures (1710 -1811) shows Edward Bovey as an apprentice to Jos Sunter, Sergemaker, at Ashburton. In 1792 Joseph Sunter, sergemaker, has property insured with the Sun Fire Office. The property has connections to Messrs Green and Cos, Warehouses 4 Little Winchester Street London. 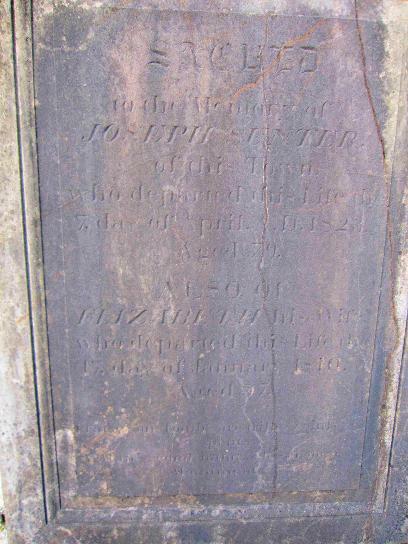 1810 Elizabeth, the wife of Mr. Joseph Sunter, was buried on January 30th. The bulk of his estate went to 'dear daughter Elizabeth'. In 1824 fourteen people were to be elected as trustees or commissioners of the Ashburton and Totnes Consolidated Turnpike. William and Joseph Sunter were two of the previous trustees. The children of Joseph and Elizabeth. Elizabeth Sunter married John Templer on 24th June 1818. In a newspaper announcement John is described as the son of the late James Templer, and A Rev. John Templer conducts the service. John and Elizabeth had 6 children baptized in Ashburton: Caroline Mary (1820), Emily Ann (1823), Charles James (1824 but born in 1823), Reginald William (1826), Henrietta Amelia (1826) and Marcella Elizabeth (1830, but born in 1828). When Caroline Mary (not named) is born, the Templers are living at Alston House, nr Ashburton. By 1829 they are occupying (and about to leave) a house in East Street. John became rector of Teigngrace in 1832, succeeding the previous incumbent, also John Templer. On the 1841 census John and Elizabeth, together with Charles and Reginald. are at Ambrook House, Ipplepen. John is described as Clerk, born outside the county. Elizabeth died on April 1st, 1850. According to the Exeter Flying Post she died at Knowle, Newton Abbot. John Templer, widower aged 62, is still at Knowles House, Highweek in 1851 with three of his children: John S Templer, Emily A Templer and Reginald W. Templer. John died in 1869, aged 80, at Highweek. He had been rector of Teigngrace for 37 years. 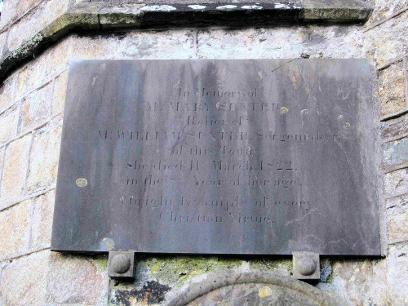 His memorial in Teigngrace church says he is of Knowle. Reginald William Templer, son of John and Elizabeth, was baptized in 1826. After the parliamentary elections of 1859 there were accusations of bribery and undue influence. Candidate Mr. Astell, who carried on 'a vigorous canvass' had agents including Mr. George Caunter and Mr. H. Tozer. Reginald Templer, a solicitor of Teignmouth was also involved, there to canvass tenants of his father, the Rev.Templer, who had property in Ashburton. The 1881 census shows Reginald William with his wife and six children in Teignmouth - Reginald Gwynne is amongst them. The Reginald G who has written in the book in the Virtual museum is presumably Reginald Gwynne Templer, the great grandson of Joseph Sunter.